Lizzie Bright and the Buckminster Boy is one of those books that deserves much more attention than it gets. Here's my attempt to get more people to read it. 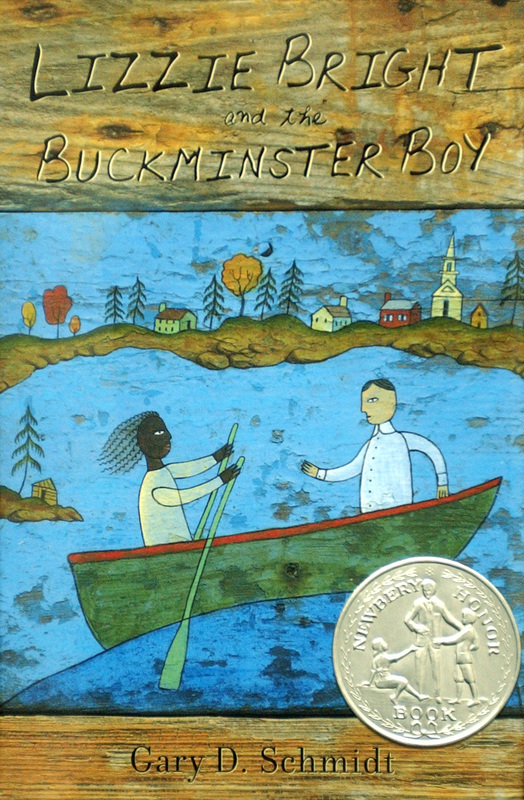 Turner Buckminster moves to Phippsburg, Maine when his father gets a job at the church there. Things start off badly and then get worse for Turner. People in Maine play baseball differently, he gets on the bad side of a cranky old woman, and his strict father punishes him for every transgression. Then he meets Lizzie Bright, an African-American girl who lives in a settlement on Malaga Island just off the shore. They quickly become friends, which bothers many of the people Turner interacts with in Phippsburg. And then he learns that the townspeople want to push everyone off Malaga Island and make it a tourist destination, and Lizzie's whole way of life is under threat. I listened to Lizzie Bright and the Buckminster Boy on audio, and I would highly recommend it. It's read by Sam Freed, with whom I am unfamiliar. But he's great. He even did Maine accents! And different voices for every character. There are so many great things about this book. My favorite was just how realistic it was about the entire situation. Schmidt does not sugarcoat anything for his audience. He also doesn't give anything a clean ending. In 1912 America, the whites will inevitably get what they want. And my gosh, they get so much and do so much harm. But it wasn't just the Malaga island community that was impacted. Schmidt also points out how greed can tear apart a family and create a lot of tension within a community. The town leaders want to make Phippsburg a tourist destination so that they can keep their town thriving after the shipping industry goes into decline. A lot of the townspeople don't agree with this new vision, and while many fight or rebel against it, it seems almost inevitable that they'll lose the fight. They still fight, though. I also enjoyed the way Turner's relationships with his friends developed. He and Lizzie became friends almost immediately, but his friendships with everyone else evolved over time. For example, Mrs. Cobb, the crotchety old woman he's forced to visit every week. She starts off seeming like this horrible, cruel person. But as Turner spends more time with her, he learns that she has quite a bit of spirit. There were so many events in this book that made me want to cry, but they were balanced by some truly resilient and wonderful characters. Lizzie Bright truly is a beacon of warmth, and Turner is kind and thoughtful. I admit some of the other characters seemed to be very extreme and one-dimensional, but this is a book for young readers, and I don't think that's so horrible. One character that did bother me was Turner's father. He felt very inconsistent to me. At the start, he is this extremely strict disciplinarian who keeps telling Turner that it will look bad if his own son doesn't behave when Reverend Buckminster is supposed to lead the whole town in good behavior. But then later in the story, he starts telling Turner to read Charles Darwin. This didn't bother me from a "no church leader would read Darwin" angle but from an "Oh, I'm a rebel at heart and just don't show it to the people who matter" angle. I don't like the assumption that everyone who went to church would never even think to read Darwin except, ironically, for the minister. And then the minister tries to prove to his son that he has some spiritual depth because he believes in evolution? It may have worked except that Turner's dad seemed the sort of person who would think white people evolved from black people, and that's not really a good way to go when your son's best friend is a girl of a different race. It just didn't ring true to me, and I didn't like that it became such a big part of the novel. It seemed to imply that people who are bumbling, greedy, racist fools could never believe in evolution while those who are not bumbling or greedy or racist, but are too scared to stand up to those people are somehow okay because they do believe in evolution. But really, that slight annoyance did not impede my enjoyment of this novel much at all. It's so heart-breakingly realistic, but so brilliantly and beautifully written (wait until you read all Schmidt's amazing descriptions of the wind! ), and I thoroughly enjoyed every minute of it. I hope you find it and read it, too, and then tell a bunch of people all about it. Not surprised! I read a book by Gary D Schmidt several years ago and thought it was great -- I thought he did a wonderful job depicting the time and the age group he was writing about. I had this checked out of the library on my Nook last time I went to visit family, but it ended up being a slightly hectic trip, and I didn't get to it. I looked back at my notes and I gave it a B-.